AVG's Virtual Private Network (VPN) offers decent network protection, and we like that it doesn't track users. But it can be pricey for a VPN that lacks key features found in less expensive software. AVG offers plans for multiple devices, but the plan you buy is device specific. So if you buy a VPN for your Mac, it will work only on Macs. If you want a VPN for PCs, you’ll have to get the specific Windows VPN. There isn’t an option that works for more than one kind of operating system. AVG offers a thirty-day free VPN trial of its service so you can try before you buy. If you do purchase the software and you’re not happy with it, AVG offers a thirty-day money-back guarantee. You can put Secure VPN software on as many computers as you like with one license. However, you can only use the VPN on one at a time. If you’re interested in trying out AVG Secure VPN on your mobile device, you’ll have to buy it first, but you’ll get your money back if you decide not to keep it within thirty days of purchase. AVG’s VPN costs nearly twice as much as higher-rated VPN software products on the market. Many PC software applications fall short when they’re converted to run on a Mac, but AVG’s VPN was created using proprietary Apple programming, which means that it will run seamlessly on a Mac. The VPN user interface is straightforward, with no complicated settings to confuse you. AVG lets you make P2Ps through their data center connections, which means you can participate in anonymous torrent downloading on a secure network. AVG offers a variety of handy customizable automation options for your VPN. It can automatically turn on whenever you’re connected to an unsecured network, and it can start automatically when you turn on your computer or when you open the program. You can also enable and disable notifications that let you know when the VPN is working. While twenty-nine worldwide servers is sufficient for decent anonymity, it doesn’t compare to top-rated Nord VPN’s 4,000. AVG Secure VPN doesn’t play well with others: if it detects that you’re connected to another VPN, it may not work properly. We appreciate AVG’s commitment to user privacy, but the Secure VPN lacks a few key security features that could leave you vulnerable, putting it behind the rest of the pack for VPNs. The biggest complaint among VPN users is that most VPN service providers track or “log” users’ activity while they’re using the VPN, making it feel less than safe. AVG has a no-log policy, which means your VPN browsing is completely private and ad-free. Because VPNs encrypt traffic and data before sending them to a VPN server, they can often slow down your connection, but AVG Secure VPN doesn’t seem to affect internet connectivity at all. You can use AVG Secure VPN to ensure privacy on both your hardwire and your wireless networks. A 256-bit encryption key isn’t weak, but it’s not the strongest out there. Other VPNs like Nord use 2,048-bit encryption. VPNs aren’t foolproof, and the second you lose your VPN connection, you’ll also lose your privacy. Most VPNs have a kill switch built into the program that will automatically cut the internet connection if the VPN fails, but AVG doesn’t come with this fail-safe. What is the difference between AVG Secure VPN and AVG Internet Security? 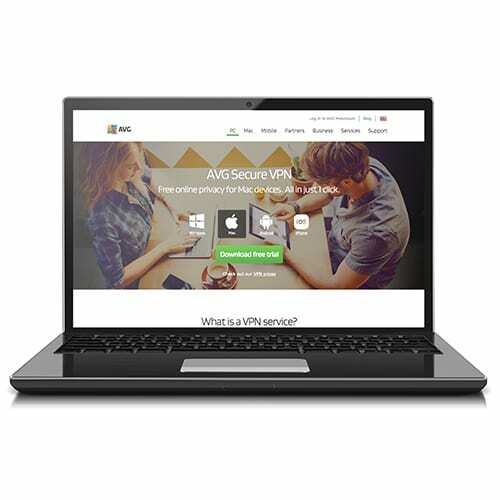 AVG Internet Security is an antivirus suite that protects your computer against malware infection, while AVG Secure VPN protects your online identity and activity from prying eyes. You can purchase them together to ensure both security and privacy. What is the difference between Avast SecureLine VPN and AVG Secure VPN? Even though Avast and AVG merged in 2016, they still offer products under each name, and the VPN offerings are slightly different. Avast SecureLine VPN costs more than AVG, but it also has fifty-four server locations around the world, compared to AVG’s twenty-nine. Both VPN services use 256-bit encryption, and both have a no-logging policy. Why did I get a message from Gmail saying there’s suspicious activity on my account when I used my VPN? How do I get the best server performance from my VPN? VPNs are ideal for frequent travelers, especially those who frequently use public Wi-Fi or need to access American websites in countries where access is restricted. VPNs are also helpful if you prefer anonymous browsing or want to participate in unregulated online activities (like torrent downloading) and avoid government snooping. To research our AVG Secure VPN review, we studied AVG’s specifications and compared them with similar VPN products. We also read others’ reviews on AVG Secure VPN and compared them with reviews for other VPN services. Visit SafeWise to find out more about our methodology.